Yo, ho, ho, and a bottle of rum! Ahoy there me lads and lasses. It’s me again, yer favorite app pirate ready to give ye another review of another game that me find from one of me adventures. Ye know that me and the crew spend most of our time booty hunting. There are days that we are lucky to find loads of booties, but there are also times that we only find few or nothing at all. At times like this, this old bucko also gets frustrated. Me release that frustration using the punching bag that we have in the ship. Well, me just found another way to release me frustration and that’s through this app called Kick the Buddy by Playgendary. Batten down the hatches as we begin with the review. This game isn’t rocket science to learn. You just have to pick the object that you want to use to bring down Buddy, which is the robot character in the game. It can serve as a stress reliever, especially if you’re feeling frustrated or angry about something. It’s helpful in a way because you can release your feelings on getting Buddy down instead of doing something that’s not so nice in real life. It may not be appropriate for kids because it has some violence on it. The main goal in this game is to knock Buddy down. It may not be a good example for kids. If you have little ones who use your mobile device, you just have to be careful that they do not have access to it or remind them that it’s only for games, in case you choose to let them play it. The graphics of the game is top-notch! The colors are full and vibrant, and the effects are also outstanding. Everything is great on the eyes. 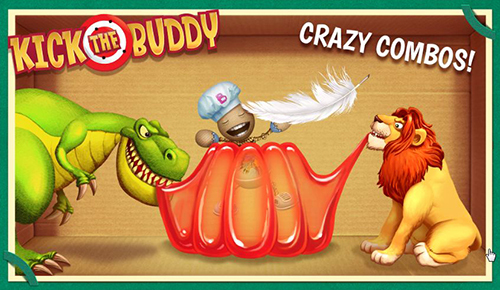 Since there are various objects to choose from that can be used for attacking Buddy, you will not be bored playing it. There are also sound effects and you can also hear Buddy talking, which is an added fun and life to the game. It’s normal for free to play games like this one to have advertisements. However, the problem with this is that the ads are too much. They come out every few seconds, even when you are in the middle of the game, which can be very annoying. This game is easy to play and it can serve as a stress reliever. 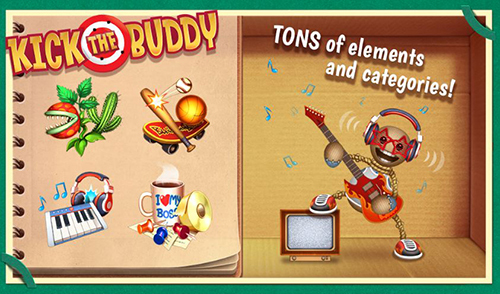 There are different objects to use to knock Buddy down, and they come with varying effects. The graphics of the game is also outstanding. It may not be appropriate for kids because it has a violent nature. The advertisements are also too much as they show up every few seconds and even in the middle of the game. The advertisements can really affect the overall gameplay of Kick the Buddy. However, if you can live with it or you don’t mind spending cash to get the game ads-free, this can serve as a good stress-reliever. © AppsPirate 2012, all rights reserved.